We were watching waves, Kjetil Våge and I, from the open transom on the research vessel Knorr. 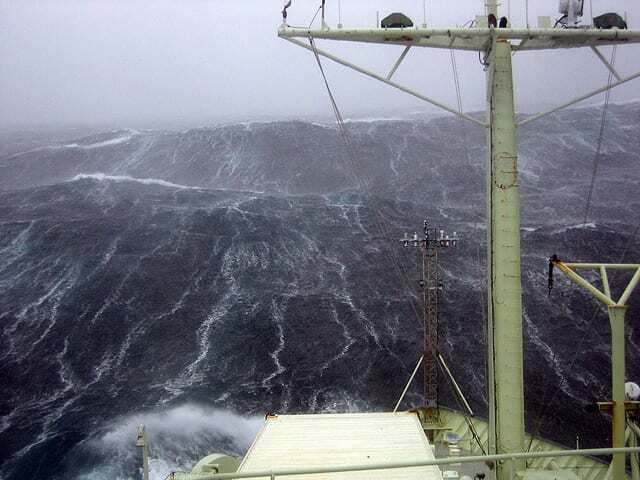 It was mid-October 2008 in the Irminger Sea, where nautical standards are different. The wind had diminished overnight into the mid-30s, the sleet had turned to light drizzle, and the waves were down around 20 feet—all in all, a decent autumn day here on the edge of the Arctic Circle. We only occasionally interrupted our discussion of Arctic exploration to dodge boarding seas. Naturally, Fridtjof Nansen’s name came up. The great Arctic explorer, ocean scientist, and Nobel laureate was Norwegian. So is Kjetil Våge. I asked him if he’d heard Nansen’s famous quip that in Arctic exploration Norwegians had a temperamental advantage over their British and American counterparts, in that Norwegians could sit on the same block of ice all winter without uttering a word and be perfectly content. Of course he had. I had heard earlier that Våge’s latest research paper had been accepted by Nature Geoscience. But I had heard it from the chief scientist on board, Bob Pickart, Våge’s Ph.D. advisor at Woods Hole Oceanographic Institution (WHOI). Våge had told no one. After congratulations, I thought to ask why he had remained silent about his success, but I already knew the answer. That would have been too forward, almost bragging. Våge is Norwegian. He grew up in Sandnes at the foot of a fjord in southwest Norway, within smelling distance of the North Sea. A geoscientist by temperament and early inclination, Våge wanted—still wants—to know how nature works, particularly the ocean. In 1998, after high school, he moved to Oslo to study math, geophysics, and astronomy. But big-city life was not to his liking, and anyway he wanted to study abroad, acquire fluency in English (now perfect) and experience a different culture. He enrolled at the University of New Brunswick, Canada, where he completed his B.S. degree in 2003. 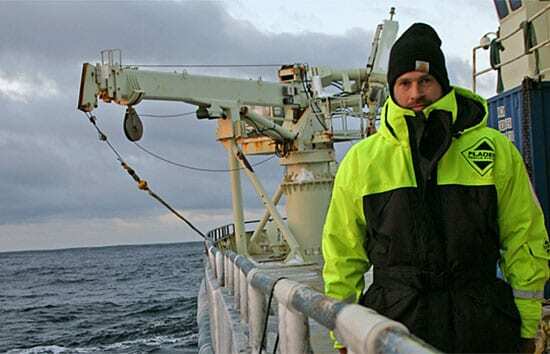 For his undergraduate thesis in a physics department with limited oceanographic resources, Våge examined the contents of automobile exhaust using laser spectroscopy, but his interest in the ways of the ocean, particularly in the high northern latitudes, abided and grew. He was accepted into the MIT/WHOI Joint Program that same year. When Våge inquired of his MIT professor, Carl Wunsch, about possible research projects in the Nordic seas between Greenland and Scandinavia, Wunsch sent him to Pickart, a paradigmatic sea-going oceanographer and Arctic specialist at WHOI. That summer Pickart invited Våge on a cruise to the Demark Strait and Irminger Sea. It was a propitious first cruise for Våge both professionally and personally. When it was over, he had found his Ph.D. advisor, laid the course of his future research, and met a Swiss marine ecologist, Selina Näf, who had volunteered for the cruise. They were married in 2006, and spent their honeymoon hiking the shores of an uninhabited fjord in southern Greenland. Våge has devoted his research to a rare and fascinating ocean phenomenon that, to appreciate, might require a little background. A fundamental precept of ocean science holds that when a quantity of water flows north, an equal quantity must return south. It happens all over the world. If it did not, then the vital interconnected system of global currents that has come to be called the Ocean Conveyor would be severed—and our climate would change radically. But the way it happens in the Nordic seas is unique. An arm of the Gulf Steam transports warm, salty water northward past the British Isles and Norway—where it surrenders its heat to the atmosphere and tempers northern European winters—and into the seas north of Iceland. Now the only way that water mass can find its way back toward the equator is to sink and flow deep beneath the northerly surface transport. The scientific term for the sinking is convection. The reason the water sinks is twofold. It loses heat to the cold overlying air and thus becomes dense, heavy. And having traveled north from the tropics, where heat fuels evaporation, it retains enough salt to prevent it from freezing on the surface like the indigenous water. 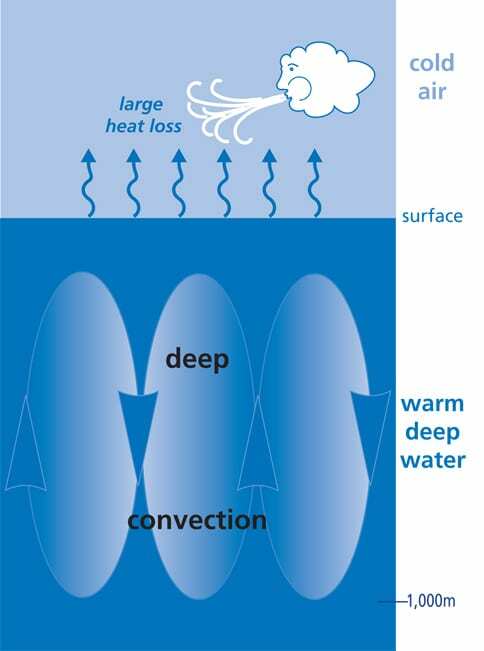 Convection occurs in various locations, some perhaps still undiscovered, in the Nordic and Labrador seas. However, the Nordic seas are considerably shallower than the North Atlantic below Greenland, and the route southward is blocked by the Greenland-Scotland Ridge, a submarine mountain range stretching from East Greenland to Iceland and the Faroe Islands, and across to Scotland. The sinking water mass must find a few rifts or valleys in the ridge through which it can plunge into the deep North Atlantic (where it thence flows southward beneath the Gulf Stream). There is one such passageway between Scotland and Iceland, and another, the one to which Pickart and Våge have directed their research, in the Denmark Strait and Irminger Sea. Using data from myriad sources, Våge determined that convection in both the Irminger and Labrador seas had been shallow in recent years or even non-existent. This was potentially troubling, since the stability of the North Atlantic region’s climate depends on convection and the downstream return flow. But then in the winter of 2007-8, Våge found that deep, robust convection had returned. Why? That’s the question Våge addresses in his Nature Geoscience paper. His elegantly simple answer: weather—a colder-than-normal winter with increased sea-ice cover and enhanced storms. Increased ice cover presented a pathway for cold, dry continental air to reach the convection areas directly without being warmed en route by an ice-free ocean surface. Increased storms violently mixed the surface water, driving the cold, salty water downward—thus kick-starting the deep convection. This was an exquisite example of another fundamental fact of ocean science: Atmosphere and ocean are a constantly interacting unity. And in these seas abaft Greenland, storms can be inordinately powerful, facilitating convection, due to a remarkable local phenomenon called the tip jet. “What’s a tip jet?” I had asked during an earlier wave-watching session aboard Knorr. Våge in his quiet manner clearly respects the elegance as well as the brute power of this tip-jet phenomenon. His admiration almost cracks through his Nordic reserve. 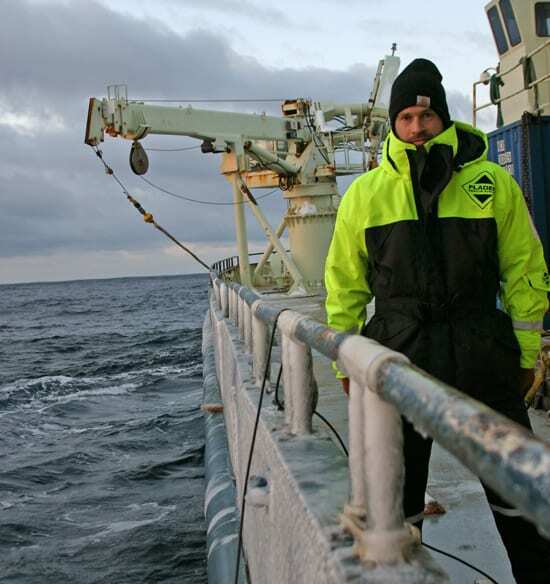 And though he completed his Ph.D. in November 2009, he will continue his research on deep convection in these subarctic seas as a postdoctoral scientist at the University of Bergen’s Geophysical Institute. He had always intended to return to Norway, and Bergen isn’t too big a town for his liking, where, by the way, he will reunite with Selina, who is there studying for her master’s degree. Nor is his collaboration with Pickart complete. They will reunite at sea, where observational oceanographers belong. Våge remains a guest investigator at WHOI. And Pickart has received funding from the National Science Foundation for research cruises in 2011 and 2012. Back on the Knorr in 2008, the waves were building. We climbed on any available objects to avoid boarding seas, the deck now awash more often than not. As we retreated into the main lab, Pickart signaled from his computer. He had found something he wanted Våge to see. Soon they were in rapt discussion, shoulder to shoulder, pointing occasionally at the screen. I pulled up a chair to listen in. I didn’t understand all their words, but it seemed clear that those of us interested in the behavior of oceans would be hearing much more from these two scientists—together and separately—about the remarkable pattern of circulation in these starkly beautiful northern waters. Knorr rolled in the beam seas; it, too, would return. 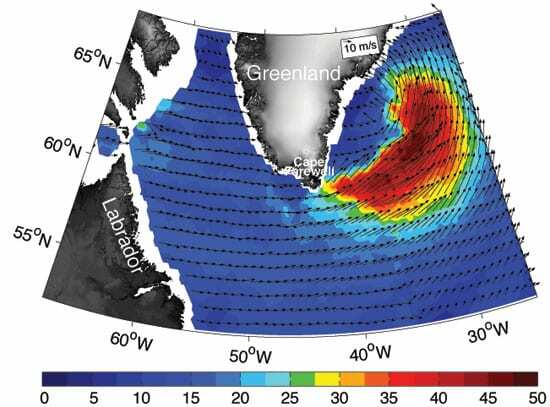 Kjetil Våge, a graduate student in the MIT/WHOI Joint Program, was lead author of a new report showing the surprising return of convection in northern seas in the winter of 2007-8. Dallas Murphy's account of research cruise to the Irminger Sea, from Oceanus magazine. A Web site with dispatches and information from the October 2007 research cruise.